Build-A-Map lets you build interactive online maps with minimal effort. With simple point-and-click user interface you are able to create visually appealing, functionally rich, and interactive maps. When you are done building, publish your map to build-a-map servers and then simply use it in your website or application. No programming skills required. 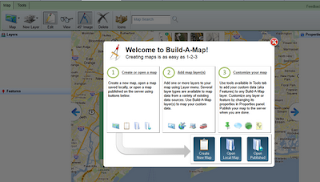 Build your maps using intuitive point-and-click user interface in a matter of minutes. Map your own data, but also use provided third-party datasources such as Google Places, SimpleGeo Places, Panoramio, and others to enhance your map. Wide range of map building tools are available out of the box and ready for use. build-a-map have invested a lot of time in building an extensible platform that allows rapid development of map building tools. This is interesting as it looks to be a significant advance over the core Google Maps map creation facility which allows the addition of points-of-interest and the saving of localities found in a Google Map search to personal maps. I am using the basic Google Map functionality in support of some job-search support for professional colleagues and the Build-a-Map solution looks like it might have sufficient functionality to satisfy some early feedback on desired features. The Points-of-Interest example provided on the Build-A-Map website ... I would suggest that the OpenStreetBrowser (www.openstreetbrowser.org) would be a highly competitive crowdsourced alternative to building your own PoI maps. By contributing to OpenStreetBrowser via OpenStreetMap, you enrich the end product not just for yourself but for all users.